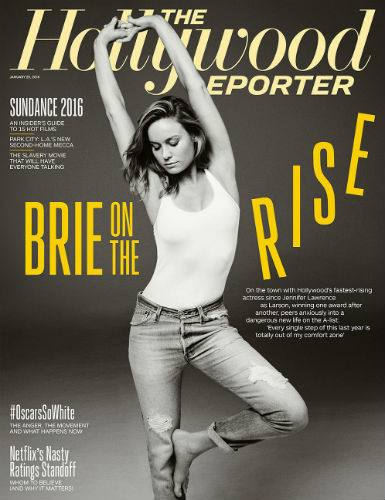 –Brie Larson is delightful in her new THR cover story, talking about how her first big splurge was on underwear, and how she bonded with Jennifer Lawrence about being the only ones to eat doughnuts at craft services. –Jennifer Lawrence and Chris Evans? Into it! –Britney Spears‘ gently bizarre Instagram continues to be the gift that keeps on giving. -Oscar nominee Mark Ruffalo says he may boycott the awards. Look, I know it’s always problematic when rich white dudes wade into this kind of issue. But the fact that he spent his day having conversations about it on Twitter, listening to other points of view and apologizing to those he offended? That’s solid. –Will Smith confirmed he won’t attend the Oscars. So he’s supporting Jada instead of the other way around? Huh. -People mag says Miley Cyrus is back to wearing Liam Hemsworth’s ring, so that’s a thing that’s happening in life. -They might be living together. too. -Meanwhile, Kanye and Miley’s “Black Skinhead” remix has leaked. Yay? –Jessica Simpson in a bikini was the top trending topic today on Facebook. Really? Cause I’m way more interested in the way her mom is posing with her son-in-law. Prioritize, people! -I really liked Lena Dunham‘s essay on why we should all say “no” more often, which is the opposite of what we’re usually told. -I’m pretty sure if I ever get a chance to interview Joshua Jackson I’m only going to ask him about possible Dawson’s Creek reunion ideas, so this interview speaks to me. -I am here for every Leonardo DiCaprio takedown article. Every. Damn. One. -Hey, remember when Tom Cruise shot down those rumours that’d he’d be starring in a remake of The Mummy? Totally lying. –Whit Stillman is doing a Jane Austen adaptation? Based on a Jane Austen book that I’ve never even read? How is any of this possible?!? -I’ll never get tired of Ellen scaring celebrities. This week: Walking Dead’s Lauren Cohan. –Jenna Fischer talking about her chemistry with John Krasinski made my insides all squishy. –Amy Schumer swears she’s never stolen a joke. So there. -You know the sign of a really good trailer? It’s when all of your coworkers end up forwarding it to each other within the span of 5 minutes. That’s what happened today at work with this NSFW trailer for Keanu, in which Key and Peele pretend to be drug dealers to retrieve a missing kitten. This made me laugh a LOT.